Today’s post sure is a TASTY one. This is my first restaurant based kind of post, because for once my boyfriend didn’t cringe out too much about me taking pictures of literally everything I could see. I really enjoy reading these kind of posts, usually for inspiration for new places to try out, even if it makes me have incredible food envy! Quite a photo heavy post lovelies, of yummy goodness! 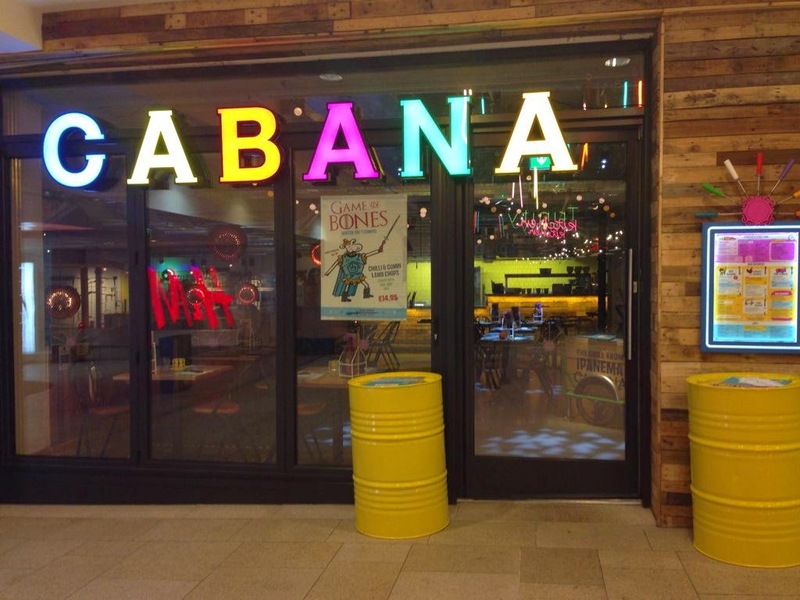 Last week I was lucky to go out to eat to Cabana Brasilian Barbecue which is based in Leeds Trinity. 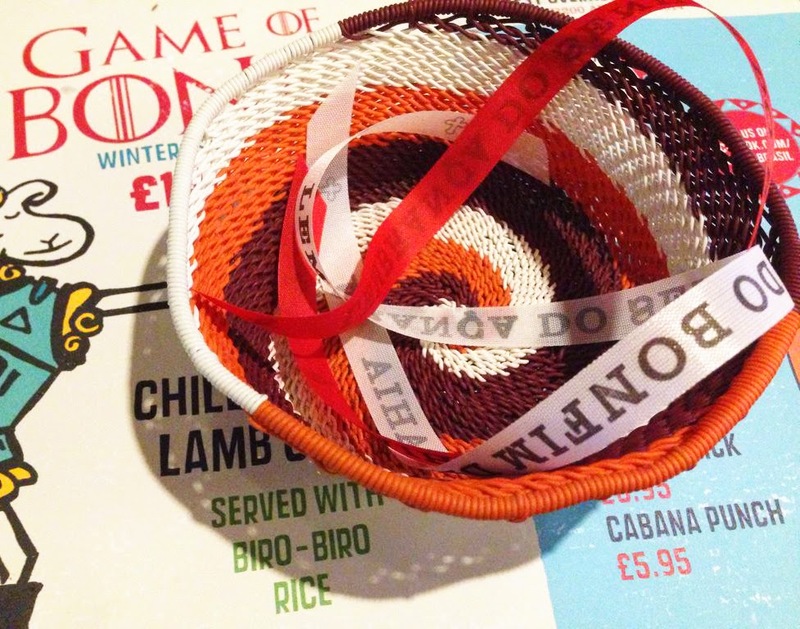 It is a relatively new restaurant to Leeds, around half a year old now, but I have been quite a fair few times now…. and I have always had a FANTASTIC experience each time. The staff make it, they are incredibly upbeat and just so so happy and energetic all the time, how do they do it?! Unfortunately for now, they are only based in Leeds (Trinity) or London (Covent Garden, Islington, London 02 Arena, Wembley, Westfield London and Westfield Stratford) but I am sure that they must be expanding! Bright and colourful, such a lovely cheerful place! 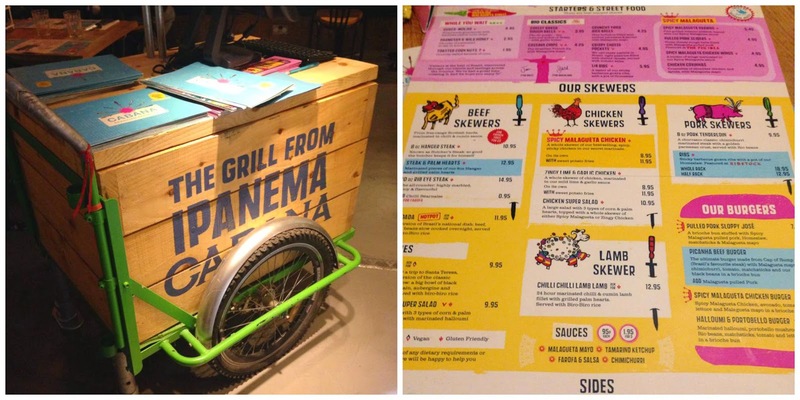 coloured menu… will have to take some inspiration from this one day! Like I said, my drink decision was EASY. 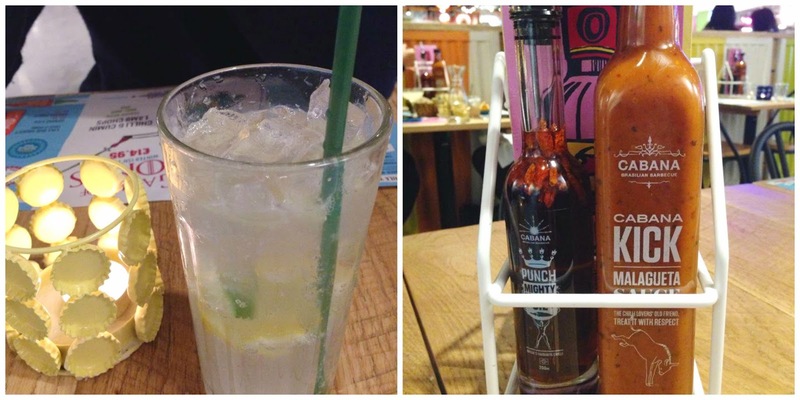 I have had this drink before and it is SO amazing MmMmMm… It is called Fresh Limonada Suissa (£2.95) Such a delicious thirst quenching drink, I couldn’t recommend it more… although next time I really want to try the cocktails, they look amazing! The sauce and oil is also amazing, YUM. Chatting, Slurping and munching away at some nibbles, tummies rumbling – waiting for our mains to arrive! Delicious marinaded chicken and peppers fresh off the skewer, so fresh they bring it still on the skewer when they serve it to you! Yum! I am not sure how to describe the marinade – but it is SO GOOD. I wouldn’t say it is too spicy, but then again I am a lover of spicy food and I also coated it in extra sauce! 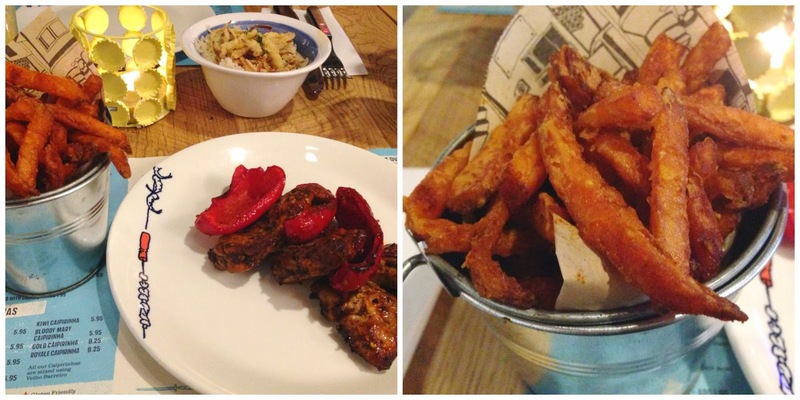 Sweet potato fries… because WHO DOESN’T love sweet potato these days?! I was so so full that I didn’t manage to eat them all – this makes me so sad because I could definitely munch those right now. But not too full for dessert….. of course. Ok. This is probably one of the BEST desserts I have had in a long time. We have had this before and adored it. It is definitely a dessert to be shared because of how sickly and rich it is, but WOW, it is truly amazing. They are the Chocolate Rainbow Doughnuts (£5.95) Warm gooey doughnuts, filled with Nutella inside, with MORE Nutella to dip in. AHH I want some right now. Truly fabulous. A very naughty treat. At the end when you pay your bill you are presented with little brightly coloured bracelets. (I can’t quite remember the story behind it) A cute Brasilian tale, but the idea is that you tie them on your wrist in three knots, making a wish for each knot. I believe that is has to fall off naturally into some running water and then your wishes will come true! A really nice touch to the end of your meal! Overall a lovely lovely experience as always, at an affordable price. The atmosphere is just wonderful, I feel extremely happy every time I leave this restaurant. I am sure I will be back soon! *TOP TIP* – I heard this from my friend the other day! (after I had visited this time) There are some quirky booths made from denim, with the ‘jean pockets’ still attached, and my friend had a little nosey in the pockets and found a voucher to claim a free dessert – what a treat! Sorry if I have made you hungry lovelies! I am starving and off to make my dinner now! Thank you for reading, I hope you enjoyed it! (Do let me know if you like these kind of posts and I can do them more often!) 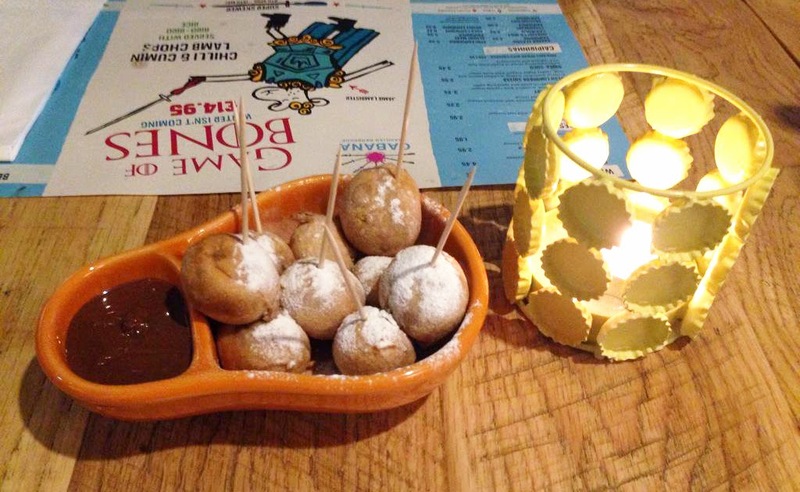 Have you visited a Cabana Brasilia Restaurant before – did you enjoy it? I love sweet potato fries! Looks like an amazing restaurant! I'll have to persuade my friends to go here next time we visit Leeds! This looks like such a great place! We always choose the classic Italian places because they're easy and safe but I love trying new places and this one looks awesome. Looks like a really nice place! Wish we had one around here to try! Those doughnuts look absolutely delicious!! The food looks so tasty and the bracelets at the end of the meal at such a nice little touch!